This is a condensed version of a presentation my kids were given many years ago. It really helped them understand the electoral college system and the difference between that and the popular vote. For some reason, my kids kept getting confused by the fact that the word "vote" was being used for the people and the electoral college so on the way home I told them to think of the electoral college votes as marbles. Whichever candidate won the state of Texas would get the number of marbles assigned to Texas and that the ultimate winner was the person who had the most marbles at the end of the race. (Husband just piped up as I was writing this with, "Yeah, the guy who doesn't win usually loses his marbles!) That seemed to help them understand it a little better especially when we talked about the reasoning behind the system. First, explain to the children that the winner of the presidential race is the one who has the most marbles in his bag, not the most people voting for him. Explain also that each state was granted a certain number of electoral marbles based on the same population percentage that is used to determine the number of seats that state has in the House of Representatives. Each state was also granted two extra electoral marbles which were representative of the two seats each state has in the Senate. Mrs. B created a fictional land called the United States of Fictionalia that consisted of only three states instead of fifty. Here is my representation of her fictional country: The state of Agraria has a population of 85,000 and has a total of 19 electoral college marbles to put in the presidential election pot. Coastalina is a smaller state with a smaller population of 35,000. They have been given a total of 9 electoral marbles. The state with the largest population is Metropolis with 110,000 people and a grand total of 24 electoral marbles. 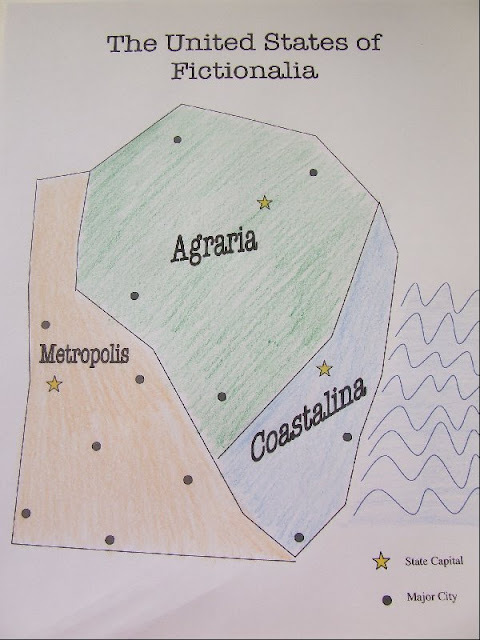 It's easy for the kids to see that in order to get the most marbles, the candidates would naturally be drawn to the state with the most marbles up for grabs (in this case, Metropolis) but you can use the following three possible outcomes to show how the founding fathers believed that the electoral college process would help ensure that the less populated states like Coastalina would not be overlooked by the candidates; they too would have their interests addressed. A PDF file of the possible outcomes can be found here. In the first scenario, represented by the first table, candidate Gene wins by claiming the marbles from the two smaller states together. In the second table, Bob wins easily by claiming the electoral marbles from the two biggest states. 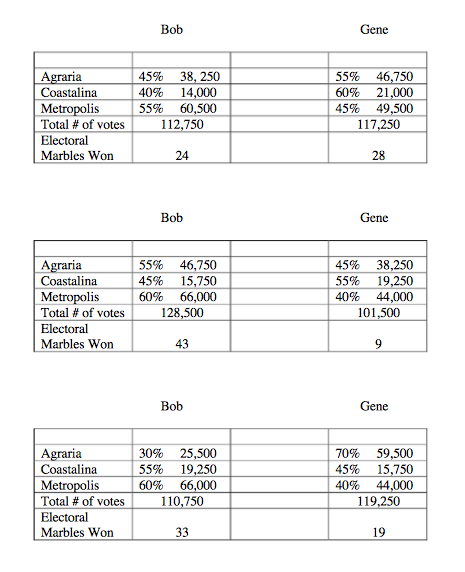 The third table demonstrates how Bob wins the election with the most number of marbles even though Gene had the most number of people vote for him; he won the popular vote. And that's about it. If you want to color your own copy of Fictionalia to use with the explanation, click here. A breakdown of the real electoral college marbles votes per state can be found in this Wikipedia article in map form. Ahhh, marbles! Such a simple idea but makes it so much easier to understand! I was trying to explain it to my son in the car today and ended up even confusing myself :) Thanks for the tips, Charlotte! Marbles, or poker chips which we have used, is great. If only how could explain how the electoral college determines which vote they are casting. I'm not sure I know myself, nor if it is honest any more! I meant to type "I could explain"
Oh! So helpful...Thank you for sharing!